On the other hand, I am slightly traumatized by being reminded that such a huge part of my life (which is still a huge part of my life) is now Olden Times. 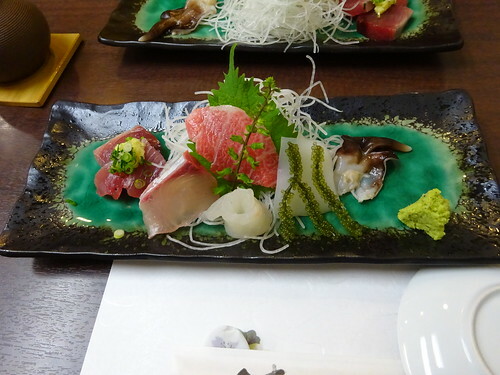 No doubt you have been feeling thoroughly abandoned as far as my Japan blog is concerned, and not without reason. My busyness has continued without let over the last week, and the present opportunity – as I travel north into deepest Touhoku on a shinkansen bound for Aomori – is the first I’ve had in about a week, when I’ve been both a) awake and b) alone (except for all the other passengers, but we try to give each other space) for a few hours together. In short, I’m an introvert who’s been living the life an extrovert, and my admiration for the latter has only increased. How do they keep it up? Still, when I think that I came here four years ago for the first time knowing nobody at all, I'm certainly not going to complain. As luck would have it, there are some experiences I can skip over quickly, either because they’re things I’ve written about before or because they don’t make for a spectator sport. 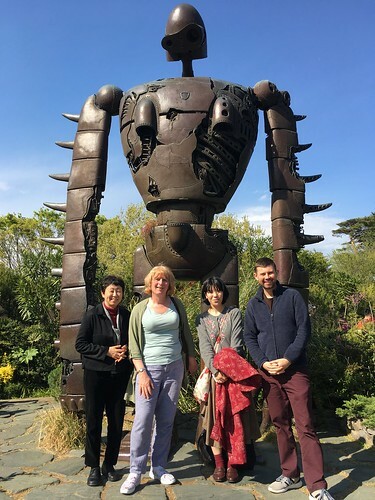 One such is my second visit to the Ghibli Museum in Mitaka last Monday. Two years ago, I went alone. This time, having ordered the tickets on the internet months in advance at 1am (effectively the only way to do it) I was with Mihoko, Satomi, and Mihoko’s honorary nephew, Mark, born in Tokyo to an Anglo-American couple, and – having lived in the States for a while – trying his luck at working in Japan. I think I would be thoroughly confused if fate played such a game of blind man’s buff with me, but he seemed anything but deracinated. We had a good time, and although Tokyo was still going through its seasonal 三寒四温 (three [days] cold, four hot) we were lucky enough to hit on a spring day that fully justified my flowery new espadrilles. I don’t think I’ve mentioned here that I’ve been collaborating on/contributing to a book on Lucy M. Boston’s Green Knowe series. It’s Miho’s project, really: she was the one who introduced me, not to the books but to the house and its chatelaine, as avid readers of this blog will know. Anyway, she asked me to check some of the Japanese contributors’ English while I was here, which is largely what has been taking so much of my time. 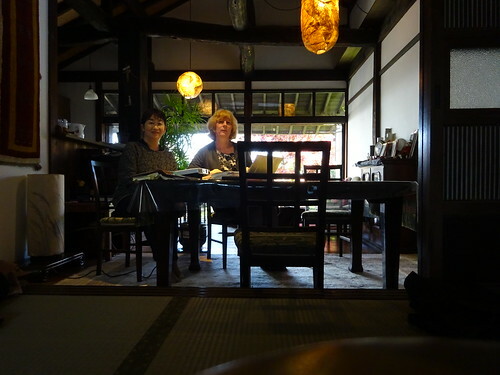 On Tuesday, that time was spent very pleasantly at the house of her colleague (and old schoolfriend) Keiko, who is a designer specialising in soundscapes, and whose beautiful house in Suginami reflects her designer’s eye. We met behind Tokyo Joshidai, my old stamping ground from 2017, whence we walked past a tiny farm owned by yet another of their high-school chums. 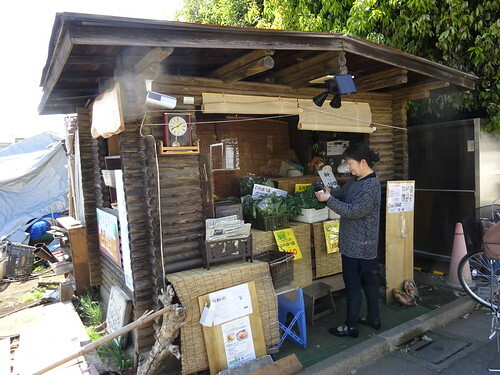 Keiko bought some vegetables, paying using the honesty box – which was pretty impressive for what is, after all, relatively central Tokyo. This system is not at all uncommon in Japan, but in the UK I’ve seen it only in the countryside. Then we went through a park with a lake with an island, said to be the habitation of a kami, though if it’s a shrine it’s an unofficial one. The reason for the holiness (or its main manifestation, if you prefer to look at it that way round) is a spring, which kept the village watered in former times. As we passed, a family walked past the other way, and I heard a young boy say (slightly petulantly) “神様が見えない”, which might mean “I can’t see the god” or “The god is invisible,” but given the note of complaint I suspect the former. We will pass over the editing work, but check out the lovely interiors! Wednesday morning I met with Philip Seaton, co-organiser of last year’s Contents Tourism symposium, in Musashi-Sakai, a bit further west than Mitaka. It was good to see him again, and talk about possible future collaborations. He told me quite a bit about life in Japan for a foreign academic, as well, and for the father of child with autism – which is not all plain sailing, you may be sure. (I was reminded of this a little later in the week, when my friend Yoshiko told me about one of her PhD students who has complained about having to sit in a class with a wheelchair user. Admittedly she thought the student was out of line, but I can’t imagine any PhD student in the UK even voicing such a complaint.) 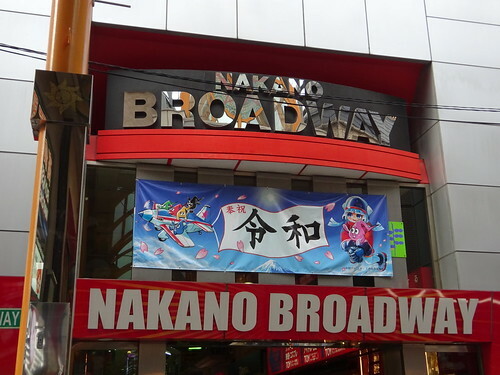 On the plus side, his son’s autism partly takes the form of an obsession with the layouts of department stores, and thanks to this he was able to tell me that in Japan – and perhaps everywhere? – there are never any toilets on the ground floor. A deterrent, I suppose, to casual urination. This is a useful life hack. 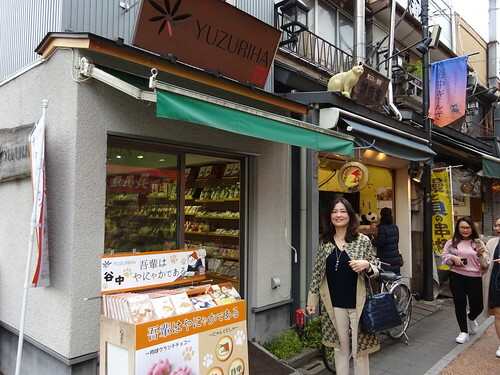 I went on to have lunch with my friend Yuki, after which we wandered the shrines and cat-focused shopping streets of one of Tokyo’s more traditional districts, Yanaka. 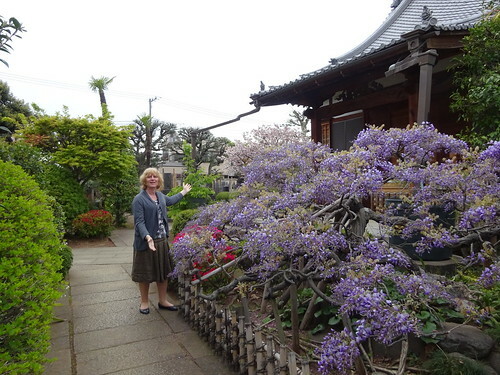 I was particularly happy to find a little shrine where sakura and wisteria (aka fuji) were in bloom together, like a little Spring miracle. 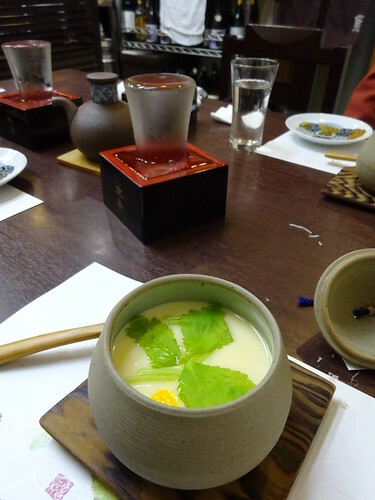 On Thursday I had lunch with Hirohisa Igarashi, a professor at Toyou University, again about possible collaborations. He’s a very charming man, and took me to a charming Italian place. Although we started off in Japanese, I found my capacity slowly ebbing away like an iPhone’s battery, and bit by bit we switched to English (in which he is, in any case, far more proficient). He gave me a little tour of the university, too, including the viewing gallery on its top floor, where a Chinese violinist was playing traditional music to set off the Sky Tree and the rest of the Tokyo skyline. Could I revive within me her symphony and song… but I didn’t have the record button on. These are of course just the very visible ripples on a deep sea of culture, but not without value or curiosity. After that, it was dinner at Miho’s with Mikako and Nobu (my interpreter at the National Diet Library two years ago, whose English I am also checking), and so to bed. 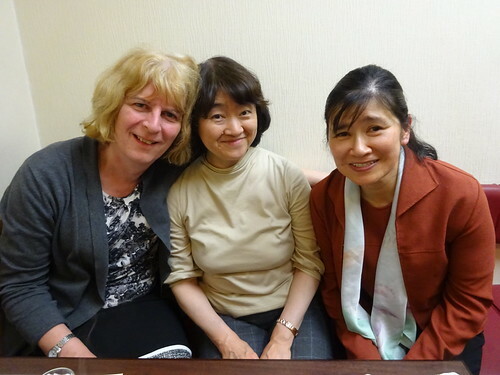 On Friday I was giving a lecture at Taisho University for Yoshiko, as I have done, now, twice before. The drill was much the same, so I won’t describe it in detail, but I gave them a potted version of my Cotswolds research, after which I had a nice chat with the students, and then an even nicer dinner (as is by now traditional) with Yoshiko and Hiroko, eating, drinking, and making scholarly. I first met them at a conference in Ohio three years ago, and have been knocking back sushi and sake ever since – albeit with long periods of abstinence, when the trifling matter of an intervening Eurasian continent adjourns our fun. I’m sure we’ll find a way to get back on track at IRSCL in Sweden this summer, though, albeit with surströmming (possibly) and vodka substituting for our accustomed fare. And thus closed my time in Tokyo. On Saturday I boarded the shinkansen for Kobe, where I had a different set of adventures, but perhaps that’s enough – or more than enough – for now. I am extremely pleased to be able to announce myself among the Guests of Honor at NecronomiCon Providence 2019. That puts me in the company of such weird luminaries as Peter Cannon, Kenneth Hite, Victor LaValle, Molly Tanzer, Dempow Torishima, and Paul Tremblay. Plus everyone else who shows up for the convention, which as I recall from 2017 is no small who's who of weirdness. I have been a guest on programming at several conventions now, but I have never been invited to be a Guest of Honor, much less a Poet Laureate. It is an honor. I am thrilled. See you in Providence in August, when the stars are right? The study of tarot is the study of questions whose answers we fear. I thought about as I pulled out my deck. I've used my Harry Potter deck for a lot of readings, but I decided for this one to go back to my Jane Austen deck, because the question I had been mulling over was about relationships, specifically, about how to handle a new relationship as well and ethically as possible, and that seemed rather appropriate. Jane does seem to focus a lot in her fiction about how to live an exemplary life. As I pulled out my materials, I discovered that was just as well. I had grabbed my tarot materials in a hurry when I'd packed for the convention, and I'd managed to leave the companion book to the Harry Potter deck behind. I'd left the companion book to the Jane Austen deck behind, too. Oops. But at least I had the little pocket guide to that deck. For this year, I asked, "What do I need to know about this new stage of my life, the interstices between widowhood and a potential new partnership?" Keeping in mind the quotation I read in my notebook, I wanted to particularly pay attention to the shadow side, what I feared and how that might get me stuck. Had a short while this morning in the rather-too-warm garden. Watered some, the sandy soil dries out quick. Pulled more miner's lettuce plus some grass. Pretty sure that the beautiful dark carnation is dead. Oh well, it was an annual that lasted for 3 years! Spent some time this afternoon working at the new bookstore. Slowly ripped out a bit of old framing that needed to go plus some blocks that had served their purpose. Then spent time in the back yard changing out some screws and painting. Made two batches of Rosemary Chicken which came out amazing, as usual!! Tomorrow off to 5 days work at the Academy of Sciences. THEREFORE, we, the undersigned call upon Fandom to recreate their online community and to do it on Dreamwidth. Lots of people, including you? Review copy provided by the publisher. I also have the privilege to know the author a bit socially. We've now had several decades--all of my lifetime, in fact--with fairy tale variations, reconceptions, recreations as a major subgenre. So the question about a collection like this can sometimes be: is there anything new to say here? Is it possible to fracture a fairy tale in a way that is not in itself a predictable part of canon at this point? Happily the answer here is not just yes, but "yes and I will even show you a little of how it's done behind the scenes." I was pleasantly surprised to reach the end of the collection and find not only notes on each story but a poem to go with each--sometimes very directly, sometimes with glancing notes on the same theme. Many of these stories are from previous decades, and Yolen takes time in the notes to talk about how she thought of them then--particularly interesting when they span a cultural shift of awareness around who gets to retell tales from whom. I'd come upon some of these stories before in other collections of Jane's, but I'm never sorry to see "Granny Rumple" reprinted--it changed my world when I first read it, and I think it can do the same for writers and readers who encounter it for the first time now. Jane's warmth and humor permeate these tales, and breaking familiar stories like Snow White and Cinderella in more than one way in one collection gives us even more perspective on what these tales can still do. This is the last in a trilogy, and it is all about consequences. Regular readers know what a sucker I am for consequences. Years have passed since the events of Amberlough and Armistice. The world is not perfect--there are still war zones--but people have started to get through the very basics of rationing and rebuilding and into questions of who should be honored and who demonized in their recent turbulent history. For teenagers like Lillian and Jinadh's son Stephen, the war and occupation are increasingly dim and distant memories, an obsession of adults. For the adults, it's still all too close and all too real--especially when parts of the past don't stay hidden in the jungle where they previously were. Frankly, most of these characters are exhausted. Their old coping mechanisms are imperfectly adjusted to their new circumstances, which keep shifting anyway. None of them seem to have had even five minutes to put their feet up, breathe, and look at some nice trees or a sunset or something. Their world is relentless. That makes Amnesty a completely appropriate book for right now--and also sometimes a difficult one. There's solace here, but it's circumscribed, constrained; there are ways forward, but none of them without cost. There is hope, but not for the things the characters used to hope for. And there are people trying to do better. Always, always, amidst rubble and chaos and machination, there are people trying to do better. Should you have access to this journal? Please speak up about it. Some of these things may be useful to you and yours if you're looking to tread a little lighter on our poor planet. I also do it for me since it's a way to remind myself of what we've done so far and what I'd like us to tackle next. It is worth noting that we've spent years on this, making a few changes every year. My goal has been to add a few new things every year, which we are on track for. I will also note that most things on my list have had a direct cost savings in the longer term, particularly the ones with start up costs. But there are also things we can't do because of finances or the state of our yard and so forth, such as growing our own veggies (our trees shade much of the yard) and there are things that stay in the planning stages for years at a time while I figure out budgeting and so forth. We also own our own home in a very urban environment in a city which supports a lot of green programs and I've done quite a bit of research and planning on all of this to approach it holistically. I recommend Green America as a good resource for tackling environmental impacts from one social justice perspective. Switched to reusables: lunch bags, dish towels, handkerchiefs, cups, straws, traveling utensils, grocery bags, yard waste containers, etc. Switched to recycled/refurbished: all paper products, aluminum foil, electronics where feasible (refurbished iPads, router, etc. ), some furniture, some clothes, plastic containers, food packages, garbage bags, etc. Other things we reuse: wash and reuse plastic bags, recycle magazines and single use containers for art projects, buy bulk and reuse single use containers for storage. Basic house greening: swapping out light bulbs to LEDs, additional insulation, improved windows, green cleaners, green care products, biodegradable cat litter, energy efficient appliances, solar fan in the attic to keep the house cooler in summer, water barrel, yard waste compost, city compost, city recycling, new plumbing with water efficient shower head, toilet and faucets, yard is completely organic and planted with pollinator-friendly plants, electric mower, we use grit to deice and our house is powered by 100% wind power through our utility. Additional stuff: Committed to buying the bulk of our groceries at the local coops and farmer's markets. In addition, we look for reuse and donation opportunities for everything we want to get rid of that's usable: clothes go to clothing swaps as well as donation bins, books go to libraries and benefit auctions, jewelry to benefit auctions, reusable computing equipment to organizations that refurb and donate it, etc. At this point, we compost and recycle much more than we throw out. Committed to not driving anywhere a few days out of the month and carpooling more and taking public transportation when we can. Biking is not a option for us physically or scheduling-wise and we still need two cars for the moment, but I hope to go down to one car and car sharing in the future and we do walk a fair amount. Carbon offsets, particularly for plane flights and longer road trips. Offset programs that I like: Nature Conservancy, MN Tree Trust, Cool Effect, Million Metres Stream Project (if we travel outside the U.S., I look for local organizations to donate to). Investments - I screen out oil companies and other big polluters from my 401K, have my mutual fund holdings with Pax World Funds and own small amounts of stock in our local coop and in Terracycle. Switched out my credit cards to cards with B-corp banks or credit unions. Regular accounts are at a local credit union. This is the first year we've gone backward. We had to have to our big ash tree in the front yard cut down due to various factors (Emerald Ash Borer, roots growing into the foundation, etc.). We'll be planting a serviceberry in its place and getting something more durable, better suited to our small front yard and producing edible berries in the bargain. Got rid of one air conditioner and put in insulating curtains in the bedroom. Replaced the utility sink in the basement. No more leaks! Added insulation in the garage. Doubled down on cutting our food waste with more meal planning, more freezing of leftovers and more focus on making sure leftovers get eaten by incorporating them into other meals and so forth. Added scrap metal recycling and rag recycling, as well as getting a paper shredder so we can recycle more paper. Redoing the attic (finally!). Between this and the furnace, we should be able to cut our house's carbon footprint by at least 50%. Other things as I discover them. And that's it for now. Feel free to share the things that you're trying or any questions you have about what we're doing. …while riding horses _in battle_ is post-Bronze Age (and perhaps of questionable worth at any time), I think riding in general is older, and probably (assuming the usual dating of PIE) common Indo-European. Mair, Victor H. “The Horse in Late Prehistoric China: Wresting Culture and Control from the ‘Barbarians.’” In Marsha Levine, Colin Renfrew, and Katie Boyle, ed. Prehistoric steppe adaptation and the horse, McDonald Institute Monographs. Cambridge: McDonald Institute for Archaeological Research, 2003, pp. 163-187. Plausible IE precursors for "horse", "chariot", and "wheel" in Sintic have been proposed. Juha Janhunen assembled a wealth of relevant data in “The horse in East Asia: Reviewing the Linguistic Evidence,” in Victor H. Mair ed.,The Bronze Age and Early Iron Age Peoples of Eastern Central Asia (Washington, DC: Institute for the Study of Man; Philadelphia: The University of Pennsylvania Museum, 1998), vol. 1 of 2, pp. 415-430, but didn't draw a firm conclusion concerning possible relatedness between IE words for horse and Central and East Asian words for horse. I do not see any particular chronological problem in connecting Old Chinese *mra with IE "mare". A possible problem is, however, the geographical distance, as cognates of *mare* do not seem to have been attested in other IE branches except Germanic and Celtic. However this may be, my point in the 1998 paper was that horse terminology is more diversified in the languages spoken in the region where the horse comes from, and where the wild horse still lives, that is, northern Kazakhstan, East Turkestan, and Mongolia. In view of this it looks like the word *mVrV 'horse' could be originally Mongolic. In any case, it was certainly borrowed from Mongolic to Tungusic (at least twice), and quite probably also to Koreanic (*morV) and Sinitic (*mVrV), from where it spread further to Japonic. From Tungusic it was borrowed to Amuric (Ghilyak). It may also have been borrowed westwards to some branches of IE, if we do not think that the geographical distance is a problem. However, even if the cognates of "mare" can mean 'horse' in general, this does not seem to have been the basic word for 'horse' in PIE. By contrast, in Mongolic *morï/n is the basic word for 'horse', while other items are used for 'stallion' (*adïrga, also in Turkic) and 'mare' (*gexü, not attested in Turkic, but borrowed to Tungusic). I have always felt that Sinitic mǎ 馬 ("horse") is related to Germanic "mare", though not necessarily directly (from Germanic to Sinitic). "mare" refers to the female of the species. However, the word is also in Celtic (see below), and how far back would that take us? …"female of the horse or any other equine animal," Old English meare, also mere (Mercian), myre (West Saxon), fem. of mearh "horse," from Proto-Germanic *marhijo- "female horse" (source also of Old Saxon meriha, Old Norse merr, Old Frisian merrie, Dutch merrie, Old High German meriha, German Mähre "mare"), said to be of Gaulish origin (compare Irish and Gaelic marc, Welsh march [VHM: ["stallion; steed"], Breton marh "horse"). The fem. form is not recorded in Gothic, and there are no known cognates beyond Germanic and Celtic, so perhaps it is a word from a substrate language. The masc. forms have disappeared in English and German except as disguised in marshal (n.). Note that the Celtic words are not specifically female; indeed "stallion" is male. how far back do the Celtic words go? how are the Germanic and Celtic words related? So much for "horse" for now. Victor H. Mair, "Old Sinitic *Myag, Old Persian Maguš, and English Magician", Early China, 15 (1990), 27–47. Available on JSTOR here. See esp. 45-46. Where and when did horse riding originate? This is the main concern of the present post. It is clear from the archaeological evidence at Botai that people were riding horses by 3500 BC. I suspect that riding began much earlier, perhaps 4500 BC. Horses were treated like domesticated animals during this period in three ways: at Khvalynsk on the middle Volga (4500 BC) their body parts were buried with humans and domesticated animals in graves that excluded obviously wild animals; at S’yezzhe (4500 BC) they were arranged in funeral head-and-hoof deposits like the cattle and sheep-goats at Khvalynsk; and horse images were new symbolic artifacts including decorative bone plaques shaped like a horse (at S’yezzhe) and stone mace-heads shaped like horse heads (at Khlopkov Bugor, a 15-grave Khvalynsk-culture cemetery 50 km south of Khvalynsk). The evidence for a significant change in the human treatment of horses during the fifth millennium BC is symbolic, contextual, and behavioral rather than zoological, but it should not be ignored, as it generally has been (for example, by Mileto et al. 2017). HOWEVER, I am also looking at the new genetic evidence for horse domestication. Some genetic traits, like the startle reflex and general skittishness, were ingrained in horses as part of their survival package. While horseback riding would have had revolutionary effects on the efficiency and productivity of cattle and sheep herding (this being a quiet pursuit) it is possible that horses were not psychologically ready to remain under control during inter-human conflicts, so their efficacy in war might have been delayed until these psychological adaptations were made. That is an avenue I am exploring and thinking about as I contemplate the gap between the evidence for horseback riding (4th millennium BC at the latest) and the regular use of ridden horses in warfare (probably 1st millennium BC). Of course horseback riding could have revolutionized warfare just by conveying warriors to the scene of the battle very quickly and then conveying them away again. That usage of horses might be very old, even 5th millennium BC. But riding a horse into a battle is a different kind of act, and requires horses of a certain temper. For a book-length treatment of the subject, see Anthony's Meisterwerk, The Horse, the Wheel and Language. (Princeton: Princeton University Press, 2007). mǎ 馬 ("horse"), Minimal Old Chinese / Sinitic reconstruction *mrâ? Horse and chariot were introduced into Shang period China around 1200 BC from the west (Shaughnessy HJAS 48, 1988: 189-237). Therefore this word is prob. a loan from a Central Asian language, note Mongolian morin 'horse'. Either the animal has been known to the ST people long before its domesticated version was introduced; or OC and TB languages borrowed the word from the same Central Asian source. Middle Korean mol also goes back to the Central Asian word, as does Japanese uma, unless it is a loan from CH (Miyake 1997: 195). Tai maaC2 and similar SE Asian forms are CH loans. Since domesticated horses, chariots, and wheels came from the northwest, it is hard to deny that horse riding, especially for military purposes, did as well. Indeed, in the late 4th c. BC, King Wuling (r. 325-299) of Zhao implemented as his most important (and very famous) reform of Hú fú qíshè 胡服騎射 ("wearing Hu [style] attire [i.e., pants, belt, boots, fur caps, and fur clothes] and shooting [bows] from horseback [in battle]). "Hu" is an umbrella term for the so-called "Five Barbarians" — Xiongnu (a Hunnic confederation), Jie, (see "An early fourth century AD historical puzzle involving a Caucasian people in North China "[1/25/19]"), Xianbei (Särbi), Di (of indeterminate ethnicity, but culturally related to the Qiang), and Qiang (Tibetic). In this wide-ranging and often controversial book, Robert Drews examines the question of the origins of man's relations with the horse. He questions the belief that on the Eurasian steppes men were riding in battle as early as 4000 BC, and suggests that it was not until around 900 BC that men anywhere – whether in the Near East and the Aegean or on the steppes of Asia – were proficient enough to handle a bow, sword or spear while on horseback. After establishing when, where, and most importantly why good riding began, Drews goes on to show how riding raiders terrorized the civilized world in the seventh century BC, and how central cavalry was to the success of the Median and Persian empires. Drawing on archaeological, iconographic and textual evidence, this is the first book devoted to the question of when horseback riders became important in combat. Comprehensively illustrated, this book will be essential reading for anyone interested in the origins of civilization in Eurasia, and the development of man's military relationship with the horse. 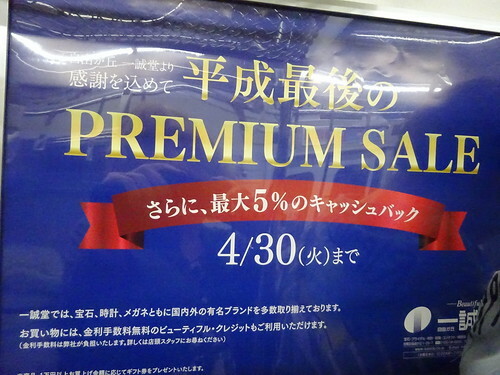 Let's take a closer look at qí ("ride [a horse]") 騎, which is the primary focus of this post. I also think the word is probably originally Chinese due to its relationship with 荷*. 骑 in Old Chinese should be *grjal. 'ride' belong to 歌部。 F.K. Li (1971) has *ar as its final. I follow Jerry Norman and Gong Hwang-cherng and reconstruct *al as its final. This is actually one of the first things that I learned from Jerry Norman in 1967-68 and now there are Sino-Tibetan cognates with WT -al to substantiate the OC *al reconstruction. 骑，奇，椅，披，彼， 疲 are all in 重纽三等， and according to Gong Hwang-cherng, Ting Pang-hsin, and ZhengZhang Shangfang, chongniu san deng has medial *-rj- in old Chinese. See Gong Hwang-cherng 从汉藏语的比较看重纽问题 in Gong Hwang-cherng Collected Papers (2002). I wrote a small paper on the reflex of chongniu in Chinese dialects. A. 一&乙are distinguished in Standard Cantonese (my wife's dialect) as well as in Sino-Japanese. B. 椅 'chair' in Soochow dialect is pronounced ü. I heard this when I was growing up in Shanghai, and was puzzled by it. It turns out that the *r- in *-rj- induces rounding in the following vowel. 椅‘chair' in Soochow dialect is pronounced "ü", and I attribute this to the fact that 椅 is 重纽三等 and as such the word has *-rj- in Old Chinese. But the Chinese did not have 椅子 until quite late, roughly Tang or Sung. Therefore Old Chinese did not have 椅 as a word. Now, "chair" was earlier written as 倚 "recline, lean against". So 椅 is literally 倚"a recliner, something to lean against." 汉语方音字汇 (2nd edition) p. 98 椅 has two pronunciation in 苏州，i & y both in 阴上。 “y" is the way the text writes "ü". During the war years in Shanghai I grew up among my mother's family. My mother's 3rd brother is Dr. P. C. Nyi 倪葆春 who got his M.D. from Johns Hopkins in the 30's and his wife 王淑贞 also got her M.D. from Johns Hopkins. She is from Soochow and I still can remember her saying "y 子“ for "chair". I also looked up B & S and learned that they reconstruct 骑 as *C.g(r)aj > gje. If you know the reason why they make this outlandish reconstruction, please tell me. Wanderwort in the E/SE Asian Sprachbund. The STEDT [Sino-Tibetan Etymological Dictionary and Thesaurus] reconstructs Proto-Sino-Tibetan *gi (“to ride; to sit astride; to sit (horse)”), and comments that "many of the TB forms seem to be borrowings from Chinese 騎". … but these [Tibeto-Burman] forms appear to involve old loans from AT [Austro-Tai] with typical loss of an original medial *w (Thai *khwi ~ *gwi). The collection of forms under Matisoff's high-vowelled *gyi 'ride' are from TB languages in contact with Chinese (Lolo-Burmese, Qiangic, Tujia): they are best regarded as late loans from Chinese. … The idea that the Chinese vocabulary of agriculture, metallurgy, horse-riding etc. might contain numerous loans from an early SEA language is simply not to be taken seriously in view of modern Asian archaeology (Bellwood 1997), quite apart from the fact that it makes no linguistic sense (Sagart 1999 for metal names). Yet Matisoff's book is scattered with observations telling the reader that words like 'writing brush' and 'ride' just discussed may well be loans from Austro-Tai into ST (188; 504). Below lists some cognates for "to ride" found in various languages in this Sprachbund. Also compare Proto-Austronesian *sakay (“catch a ride, join a group, ride on something”). It's evident that proposals for the origin and influence of qí 騎 ("ride [a horse]") are all over the place, with some proposals being completely opposite to each other in terms of directionality. Bottom line: It's easier, more believable, and more demonstrable for things (horses, chariots, wheels, etc.) and the words for them to be borrowed than for words and ideas alone. Archeological, art historical, historical, textual, genetic, and other types of evidence may be brought to bear on our deliberations to avoid the likelihood of deceptive look-alikes. In contrast, it's less likely for actions (riding, walking, sitting, eating, etc.) and the words for them to be borrowed. For the moment, it seems to me that qí 騎 ("ride [a horse]") was adapted from a native Sinitic word (probably one cognate with the word family of yǐ 倚 ("lean [on / against]")* rather than borrowed from outside, even though the skill and habit of horse riding were learned from an outside source. Still, I'm prepared to be persuaded otherwise if sufficient evidence to the contrary is adduced. In this personal communication, Pita Kelekna responds directly to the comment with which this post began. That paragraph is followed by a summary of relevant extracts drawn from her magnum opus, The Horse in Human History (Cambridge: Cambridge University Press, 2009). I am not too sure what the original rather blurred question was all about. I really do not think equestrianism is of "questionable worth at any time"; on the contrary, I believe it has shaped the modern world! On the topic of The Emergence of Germanic, I felt it was important to show, even given horse-domestication origins in Pontic-Caspian Proto-PIE, the extraordinary geographic diversity of cultures contributing to the development of equestrianism over the past six millennia. Western Europe, was a bit of a late player in terms of military cavalry. Hannibal was able to blaze his way through Spain and the Alps with 9,000 cavalry to totally annihilate the Roman armies at Pavia, Trasimene, Cannae (217-216 BC). It was only when Scipio Africanus forged an alliance with Masinissa's Numidian cavalry that the Romans succeeded in defeating the Cathaginians at Zama in 202 BC and subsequently adopted cavalry into their armies. Even in the fifth century, the Huns wreaked total havoc in Central Europe; of course, subsequently in the sixth Charlemagne got his act together vis-à-vis the Avars . In the thirteenth century, the Teutonic knights fiercely resisted the Mongol invasion at the Battle of Wahlstadt as did King Wenceslaus later in Bohemia. Hunted worldwide to near extinction, the horse was first domesticated for its meat by agro-pastoralists of the Pontic-Caspian steppe approximately 6,000 years ago. DNA evidence from stained ceramics and other archaeological deposits at Botai, Kazakstan further indicate that by 3500 BC horses were both milked and penned. Overland bulk transport during the early Bronze Age involved bovid draught of wooden carts and wagons. Debate has long raged as to when horse-back riding was first initiated. It should be noted here though that the wild stallion was a highly irascible animal and mastery of its extraordinary speed did not develop overnight—far from it in fact! It is perhaps possible that, on the western steppes among Yamnaya steppe agro-pastorialists (3300-2600 BC), the more placid mare might have been mounted over short distances, as in herding, scouting, or rustling. However, more likely domesticated horses early served as pack animals; their superior speed over oxen and higher gait in traversing rivers no doubt proved to be invaluable in the fourth-millennium BC Proto-Indo-European diaspora across the steppes, west to Europe (Corded Ware 3100-2600 BC) and east (Afanasievo 3200-1800 BC) almost to the borders of China. During the mid-late Bronze Age, there emerged on the steppes southeast of the Ural Mountains (2100–1800 BC) the Sintashta culture of advanced metallurgists. Endemic intertribal warfare, intensified by competition over resources, resulted in construction of fortified settlements protecting mining interests and eventually led to dramatic advances in military technology, namely the spoke-wheeled chariot. This new vehicle differed mightily from its clumsy disc-wheeled cart or wagon predecessors, in that it represented an essentially light, resilient conveyance, designed not for transport of heavy loads, but for utmost speed; the earlier bovine yoke harness, ill-suited to horse anatomy now rectified with neat-fitting yoke saddles, assured high-maneuverability in hunt and war. In the course of the second millennium BC, from Sintashta, Indo-Aryan charioteers sped south to India, Iran, and Anatolia, with subsequent war- chariot expansion to the Near East and Nile Valley, then later northwest toward the Atlantic and northeast as far as the Pacific. The war chariot, in fact, would rule the battle field for over a thousand years. Notwithstanding, yet another revolutionary development was on the horizon: competent horseback riding! Pirak (c 1700 BC) on the Kacchi plain possibly furnishes the earliest direct evidence of horse riding, in the form of terracotta figurines of horse riders with legs bowed around the body of the horse; also encountered were the first traces of imported iron artifacts on the subcontinent. To the west, a bronze figurine of a horse rider dating c 1000 BC was retrieved from a Koban burial on the northern slope of the Caucasus. And in the Siyalk cemetery, just east of the Zagros mountains near the Nisaean plain, together with bronze cheekpieces and bit, a seal showing two archers wearing pants and mounted on horseback was unearthed and dated to the ninth or eighth century BC. To the east at Cherchen in the Tarim basin, from the grave of a Europoid mummy (c 1000 BC), a leather saddle, woolen breeches, riding boots, and a bronze bridle were excavated—all the equipment needed to exert full mastery over the ridden horse. On the steppes, equestrian riding skills immensely facilitated the capture and domestication of large numbers of horses, furthermore mobilized herd management of many more cattle and ovicaprids, effecting immediate broadening of the resource base and progressive penetration of new zones for eventual exploitation Nevertheless, this transfer to extensive, mobile pasturing had certain drawbacks; in remote regions of the steppes, herds were ever vulnerable to alien predation. Clearly, the mounted warrior was only as effective as his control over his steed. With horse-riding now at a premium, competition over pastures stimulated intensified production and diversification of offensive weapons. Accordingly, primitive leather bits and horn cheek-pieces soon were replaced by superior bronze and iron fittings. Along with these improvements went equestrian combat. Most important for equestrian warfare was the invention of the recurved composite bow. Short and light, the bow in hunt and war permitted rapid discharge of arrows, as many as a dozen a minute. It further facilitated agile archery from the saddle, by allowing shooting while in retreat. Thus equipped, Saka, Sarmatian, and Scythian nomads not only dominated the Eurasian steppes but also inflicted savage depredations along their southern borders that threatened the heartlands of sedentary states. In the seventh century BC, Cimmerian cavalry erupted through the Caucasus to invade Anatolia, where they attacked Urartu, Assyria and Phrygia. In the sixth century BC, Scythians undertook devastating raids and exacted tribute from towns in Mesopotamia and Syria, finally confronting the Egyptian pharaoh Psammetichus in Palestine. In the fourth century BC, adopting steppe practices, Phillip and his son Alexander in northerly Macedonia were the first Greeks to make extensive use of cavalry, introducing onto the battlefield far-reaching reforms which placed their army at the forefront of military technology. In 334 BC Alexander’s army, 30,000 infantry-strong with 5,000 cavalry, crossed the Hellespont to liberate the Greek cities of Asia Minor from Persian rule. Macedonia’s cavalry victories there subsequently led to conquest of the Achaemenid empire and invasion of the Indus valley. In the east, the first chariots to reach China appeared abruptly at Anyang c 1180 BC, where they first served the Shang as mobile command platforms; only under the Western Zhou (1045-771 BC) was tactical use of the chariot as an agile combat machine first deployed in large numbers. Just as from the fifth to third centuries BC, the feudal states of the Chinese heartland fought interminably among themselves for military and political advantage, they fought equally as often with the steppe nomads persistently encroaching upon their borders. By 484 BC, horse-mounted warriors had made their initial appearance on steppes northwest of China. These horsemen were amazingly mobile, moving rapidly from one point of attack to another, and almost always directing superior forces against the slower Chinese defenders. Despite walls being built against nomad incursions, in 307 BC King Wuling of Zhao, in order to address military threat to the Chinese heartland, formally instructed his people to learn the arts of both horseback riding and archery, decreeing for the army the adoption of equestrian attire, namely the sleeved jackets and trousers of the steppes. During the turbulent Warring States period, the most dynamic of the principal states was Qin of the Wei valley. From this western location, equipped with iron and bronze weapons and deploying chariots and cavalry, the (soon-to-be) emperor Shi Huangdi (221 BC) undertook a long series of military campaigns that ultimately unified the warring kingdoms into one imperial state. Rapid horse communication and transport allowed national boundaries to be established and defended that would define China for the next 2,000 years. Other imperial armies similarly deployed cavalry alongside chariotry. But in the west, it is clear that military cavalry soon superseded chariotry on the battlefield. In Phrygia, during the Fourth War between the Diadochi (successors of Alexander) at the battle of Ipsus (301 BC), conflict involved 45,000 cavalry while 100 scythed-chariots remained un-deployed. The military tumult at the northwestern frontier not only impacted China’s interior, it also had far-ranging repercussions across the Eurasian steppes. The Xiongnu nomads, a multi-ethnic confederacy (Turkic-Mongol-Tungusic) repeatedly attacked Indo-European polities of the Tarim basin and Ili valley (175–162 BC), forcing them to seek refuge west and south in Sogdiana, Bactria, and the Caucasus. Relentlessly, the Xiongnu military migration continued westward arriving as Huns in Europe, where under the command of Attila (434–453) they ravaged the Danube basin, Balkans, southwestern Gaul, and Italy. Fortunately, the Huns did not deliver just plunder, they also brought innovative equestrian tactics and techniques from the steppes. A century later, due to the Turkic Avar invasion, the Chinese cast-iron stirrup diffused first to the Constantinople and later to the northern German tribes. This invention of paired cast-iron stirrups revolutionized equestrian warfare in Europe, making possible the rise of the medieval heavy armored knight, whose campaigns in the centuries ahead would defend Christian territories against foreign intruders: Islam from the Near East, North Africa, and the Iberian peninsula; nomadic steppe tribes, Mongol armies, and Ottoman Turks from across the eastern borders. One offshoot of the heavy armored knight was the conquest of the New World. On his secondTransatlantic voyage, Columbus loaded aboard many horses and mules; plenty others followed on subsequent trips. Fresh from their victory over the Moors, the Conquistadors’ cavalry skills swiftly toppled both Aztec and Inca empires. Ironically, the feral horses that escaped from Spaniards onto the prairies and pampas furnished the steeds for ferocious Amerindian light-cavalry resistance to the European invader. And gaucho cavalries not only thwarted the 1807 British invasion of Buenos Aires, their spirited warring forged independent nation states as the Spanish and Portuguese were ousted from Latin America in1826. In Europe, where modern nation states fought endlessly among themselves, cavalry maneuvers were coordinated with sophisticated artillery and firearms. But in World War 1, aerial assault and bombardment made short shrift of cavalry in the European arena. Not so in Palestine, however, where the Australian “Waler” outperformed the Arabian horse in the desert. This very last successful deployment of mass cavalry in offensive tactics took place in 1917, when the Australian Light Horse charged and overran the Turks to capture Beersheba and its all-important wells. This dramatic action to defend the Suez, launched against a capable foe was one of the most astonishing feats of the war. Contrastingly during World War II, in 1941 northwest of Moscow, the 44th Mongolian Cavalry Division charged the German lines at a gallop “stirrup touching stirrup, riders low on their horses’ necks, drawn sabers over their shoulders.” In ten minutes of withering machine-gun fire, without a single German casualty, 2,000 Mongol horsemen and their horses lay dead or dying in the blood-stained snow. Remarkably, despite the twentieth century’s decreasing emphasis on the horse in battle, during the US twenty-first-century invasion of Afghanistan, the horse once again saw combat duty with Special Forces units in the northern mountains, as did the donkey in its ancient role of beast of burden, in terrains inaccessible to motorized transport. Military riding, it would appear, has spanned many millennia and many continents. I saw the movie Apollo 11 this afternoon, at the Somerville Theatre, and enjoyed it. This film is very much what it says on the tin, a documentary of the Apollo 11 flight put together entirely from archival footage, and works well. I recommend seeing this on a large screen (in a movie theatre, or maybe on a large flat-screen television, rather than something like an iPad). I had meant to go sooner, but I've been dealing with a lingering cough; there were a few days when I wasn't exactly sick, but was still coughing enough that it seemed unkind to go to the movies. By this afternoon, I sat for more than an hour and a half without coughing at all, aided only by a single medicated cough drop. The MBTA will begin demolishing the Ball Square Bowling alley tomorrow, according to the "Construction Update" email that the City of Somerville sent me last week. Starting Monday, April 22, crews will begin demolishing four buildings on Boston Ave. near the Broadway intersection, where the new Ball Square T station will be. Demo and debris removal will continue throughout the week between 7 a.m. and 3 p.m., requiring lane shifts around the work zone. Long-time readers of this group and its LiveJournal predecessor may recall a big party that we held there in February 2010, organized by plumtreeblossom. Here is a Flickr album from that night, including some backstage photos of the pin-setting machinery. Oh, this was a lot of fun! I'm sitting at a sidewalk table outside a restaurant. I've finished my coffee and I'm just enjoying the day.They said it's okay with them if I just sit here, and they're closing up anyway. I can tell you, I was quite surprised at the way French was coming back to me! She was from Belgium, it turned out. She wanted to know when the salon would be open. There wasn't any sign on the store, but I said something approximating French for «Wait a minute, I can probably look it up on the Internet.» After a little poking around on my smartphone, I found the hours and showed them to her. She thanked me, I waved into the stroller and said "Hi, little face! ", and she went on her way. conuly - Happy Easter and Passover!